More than half of Americans are living paycheck to paycheck and have less than $1,000 to their name. Between escalating rents, high housing prices, inflation, bills, astronomical daycare costs, unprecedented student loans, and the cost of day to day life, it’s a wonder we don’t have a bigger problem! Living is expensive. There are so many factors that contribute to your depleting bank account, but hidden costs and fees shouldn’t be one of them. 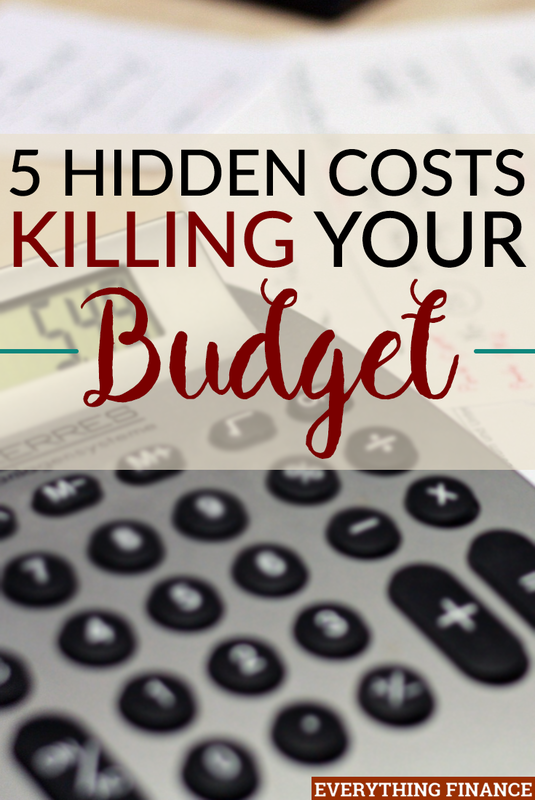 Here are five hidden costs that are killing your budget and how to fix them. How much television access do you need? Between Netflix, Cable, Hulu, Amazon, Apple TV, etc., don’t you think you have enough? Limit the number of subscription services down to what you really need to watch. Everybody knows not to visit Starbucks if you’re on a budget. But what about all the other “latte” factors? Those small purchases that really add up over the course of a month? A random take-out lunch because you forgot to pack your lunch for work. A couple of candy bars, gum, and a magazine at the checkout aisle at Target. An ATM fee because you didn’t get cash at your bank. All these tiny expenses can wreak havoc on your budget. For one month, keep complete track of all expenses to find out where you can reduce and plan ahead. Have you ever been caught off guard that your insurance premium was due? What about your car registration? These expenses can sneak up on you and also cost a big chunk of money. Take the cost, divide it by 12, and on a monthly basis, transfer this amount into a savings account that you keep separate and earmark specifically for these purposes. Companies have figured out an easy way to make thousands of dollars a year without it costing them a cent: the invention of Auto Pay. Oh–it will make it so easy for you, they said. Just set it and forget it, they said. That’s exactly it. Bill collectors want you to set it and forget it so that you forget to cancel that service you don’t ever use anymore. When my husband bought a used car, the upgraded radio subscription remained on for several months before the previous owner took it off auto pay. Auto pay can be convenient for things you HAVE to pay, like your mortgage, or student loans. But it’s really inconvenient, and downright dangerous, for optional services that will continue to take money out of your account. Be wary of auto pay and make sure to check your statements religiously to confirm you’re not being charged for something you cancelled, thought you cancelled, or no longer use. How many times have you purchased something just because it was on sale? You could have bought $100 worth of left shoes, but how much did you save if you can’t wear two left shoes? Don’t fall for the “For Sale” trap. Before making a purchase, ask yourself if you would buy it if it cost twice as much. Then you know whether you really need it or not. Are any of these hidden expenses killing your budget? What budget leaks have you experienced?